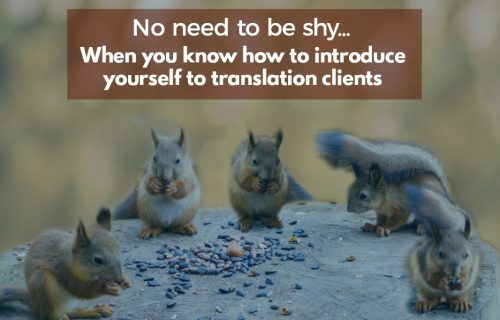 So you’ve come up with the motivation to finally start reaching out to clients about your translation business. That is a great step that should be celebrated! But, like a newly hatched bird falling from the tree, you may be a bit shaky when you first try out your wings. In this post, I go over some key mistakes to avoid that will get you soaring in your client-finding skills in no time. You know how squirrels are always scanning the environment for that better nut? Don’t be that. Instead, focus on the acorn that will get you through the winter. 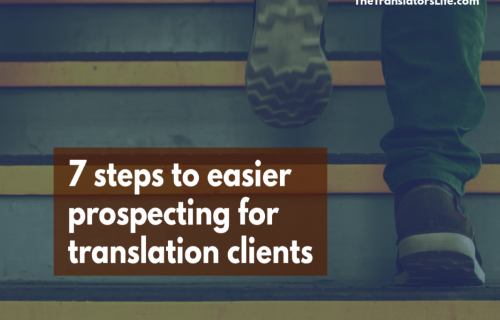 For your translation business, this means that you want to go after that one money-making sector that has the most potential. You may fear that, by excluding companies in other sectors, you are missing out on opportunities. 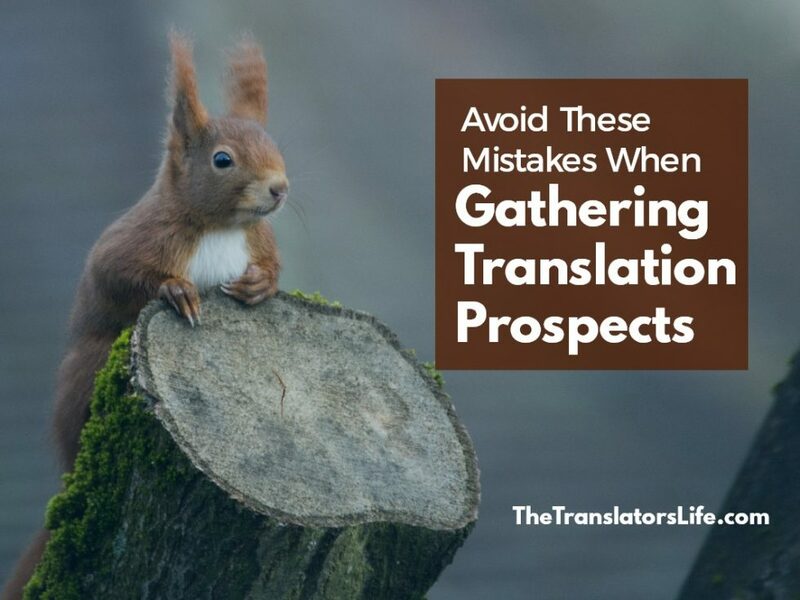 But with millions of companies out there who might want translation, you have to narrow things down, or you simply won’t get very far in your gathering efforts. If you aren’t sure which sector to focus on, here are some ideas to get you started. Just because a company falls into your market path doesn’t mean you should scoop them up and put them on your prospecting sheet. Instead of throwing every company you come across on your prospecting list, be picky. 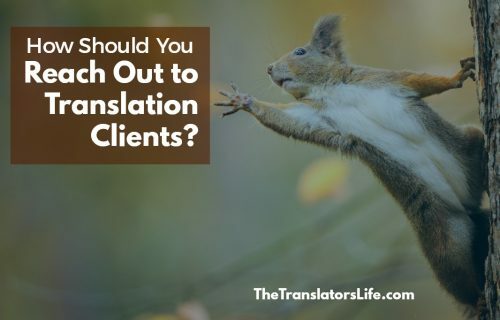 When you look for companies, always ask yourself these two questions: why is the company translating and what are they translating? Another way to focus your search is to avoid chasing down every company who looks like they might fall in your sector. You want to curb those impulses and just chase the ones with money to pay good translation rates. You might not be able to find all of this information for every company. If you think that the company has a chance of meeting them, then include them on the list, and you can cross them off later if it doesn’t work out. While focus is excellent, if you stick your head in the sand and hyperfocus on one type of company in your sector, you may be limiting yourself. Even if your sector is “health care,” you don’t have to target hospitals alone. Joint ventures: Look for complimentary service companies, like writers or graphic designers, who work with the same companies you do. Advertising and communications agencies: These firms often want to be a one-stop shop for clients and hire their own freelance translators. It’s so tempting just to timidly Google “IT companies” and search through the top results. While that’s an easy search method, your timid searches will have limited results. So much company information is not accessible on the web and therefore non-Google-able! Go to your local library: For example, the provincial library here in Quebec has a list of resources you can use online. However, you can only access the more robust tools at the library itself. Look up free directories: Governments and associations around the world release this information, but you do have to dig. Mine LinkedIn: Especially when you want to figure out the best person to contact at a company. Head to boards and associations: A chamber of commerce in the biggest city where your potential clients do business or a sector association can give you laser-focused lists for your searches. Sometimes when you look at a prospect’s website, everything looks well translated and updated. You may think that these prospects aren’t good ones because they already have the translation service they need. You feel like maybe you’re bothering these companies if you reach out to them. But that’s not true! They just may not be ready for you now. Maybe their existing translator is just about to retire. Or maybe they will need extra help for a humongous web project that they’ll need to split up in a year from now. Part of your searches should include companies you would love to work with but who may need some nurturing. Then, when their regular translator goes on vacation or retires, you’ll be right there to help out. I get it. Compiling company names is boring and one of the least interesting parts of marketing. It takes time at first, so your instinct is probably to put the minimum amount of information in your database, like just the company name and website. But this attempt to avoid work will create work for yourself in the long run. Take the time it takes to put precise and full details in your database. You can even use a free program like Insightly or Pipedrive to manage all of your information. The reality of business is that it takes time to find the right fits for your service. That’s the law of the jungle. Correctly scouting your targets doesn’t happen overnight. So don’t look for easy ways to get this part done. And when you take your time to fully grasp and effectively execute your client-finding, this smart investment will pay off big time in better clients who pay well.